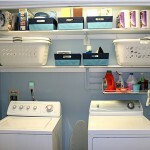 My Laundry Closet Needs a Makeover | Your home, only better. My laundry room is just an upstairs closet off the main hall. But it’s also the only “room” in my home that I haven’t at least painted! 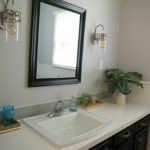 I actually started this project over a year ago by adding “Laundry Room Flair” with cute knobs, writing on the wall and a fun switch plate cover. But what you didn’t see was the INDSIDE of my laundry room closet! Oh the shame! Ok, I’m baring my soul and messy innards of my laundry closet here, so be kind! Here is the “before” picture. Now I realize that by posting this picture, I actually have to get this project done. Give me a couple weeks and I’ll show you the “after.” Keep me honest and don’t let me off the hook! I like the use of color and consistent bins. But it almost looks too staged – what are the odds that the towels, hanging laundry AND laundry in the dryer will all be color-coordinated? This one is a bit more realistic – showing multiple uses of the space. I think I’d bump my hip on the counter after I tripped over the pretty pail on the floor. 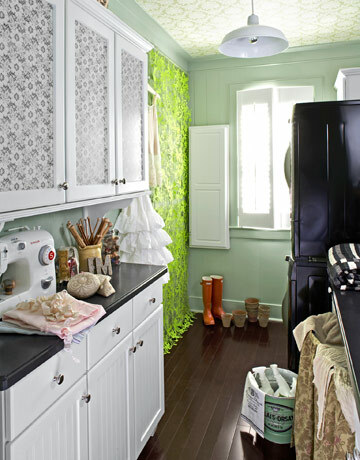 While I’m not a wallpaper fan, I think it adds some fun personality on the cupboards. Overall, a fun and eclectic design. 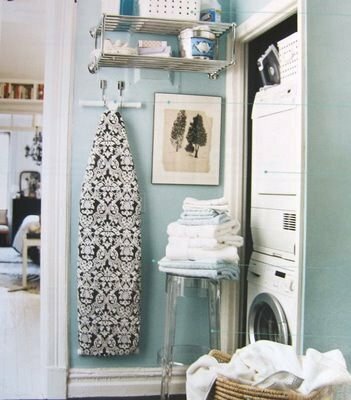 Here’s a great use of a small space – even the ironing board has décor duty! 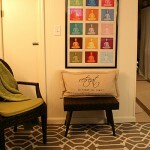 Note the use of one large simple piece of art – small items in a small space get lost and become clutter. Fun use of stripes, and note the track lighting. 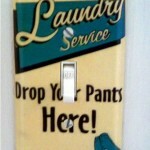 Now Showing (drum roll) – mom doing laundry! But seriously, you’ve got to have lots of light to find stains no one bothered to tell you about and collect any money left in the pockets (that’s my tip)! I also like the use of shelves on the side walls – gives the room a bit more dimension. 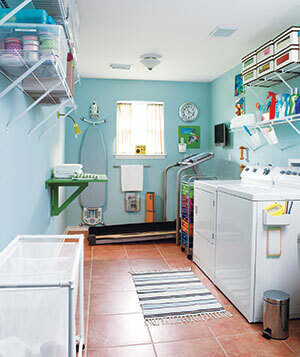 Ok, lets get our heads out of the clouds and back to reality – what tips do you have for my humble little laundry closet? I should tell you that the color will have to be blue (because I’m using leftover paint from my kids’ bathroom), but I’m looking for easy (and inexpensive) organizing and decorating ideas! There are some blocks holding up the one wire shelf that is already there. I think one shelf higher up would help too. homes. 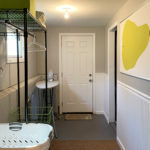 I’m learning on my own about colors and design – anyway, The Laundry room is hard to do from what I’ve seen, even in the $650,000 homes the Laundry room is where the professionals seem to lose thier creativity. 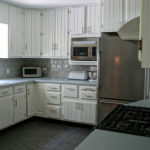 The usual model home is usually a solid color with two pictures with the same theme above the washer and dryer. I love the first one with the bins on the shelves. This is a great use of space and looks great. Unfortunately, knowing myself and most people it would look like this only once in a great while. Where do people put all of their clothes to make it look so nice! Apparently, they have way more time than me. Use the vertical space. 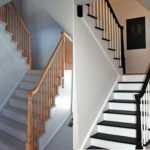 Maybe combine a closed cabinet and open shelves deep enough for the laundry basket on the bottom, narrower as you go up. I like blue, paint the insides of the cabinet too. Nice canvas baskets for sorting. I keep a container for lost pennies too! 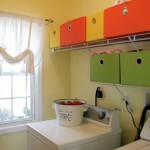 I like the space between the washer and dryer you could put shelves and have room to stack baskets. .-= Pat Smith´s last blog ..In the Red Zone =-. 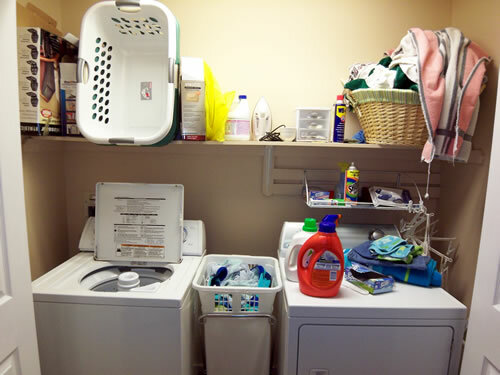 My laundry closet looks almost exactly like yours! 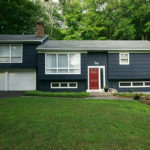 and it’s in dire need of a makeover, too–starting with new appliances. My dryer has had it, and the washer started making strange noises recently. Not a good sign. Love these inspiration pics. 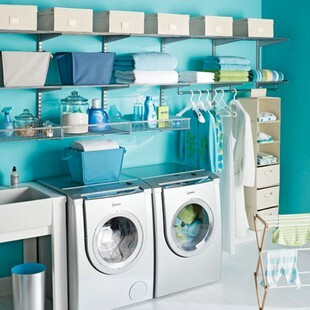 I would love to have a separate laundry room that was big enough to really go to town with. Maybe I’ll at least try to re-paint mine when we get the new washer/dryer. Okay Miss Susan…I’ll be tuning in to keep track of your progress. I HATE my laundry room. Obviously designed by a man…I feel like I’m working out of a phone booth. Inspire me Susan…Inspire me!!! 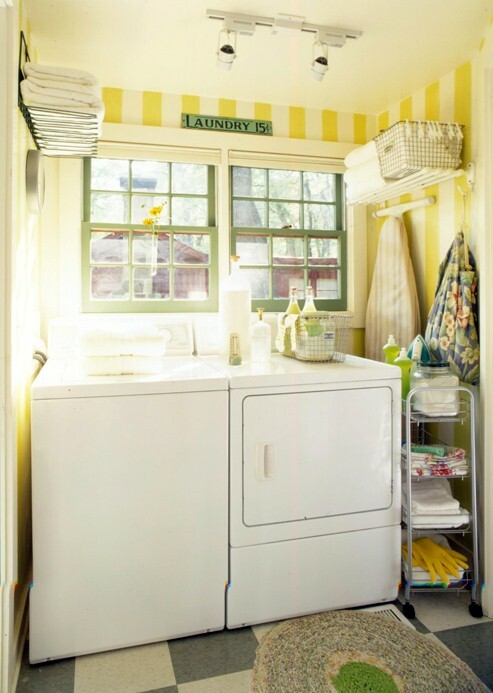 Oooh, horizontal stripes – love that idea! 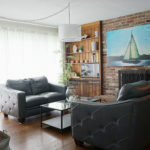 I think I’ll paint all accent pieces white – there are some blocks holding up the one wire shelf that is already there. I think one shelf higher up would help too. My only suggestion is to mix in a little white into half of the blue paint and paint broad horizontal stripes with the two tones of blue. You may not be able to create much more visual interest because you’ll want to keep it practical. White shelves will be useful. Maybe more shallow shelves on the lower levels and wider ones up high? .-= Why S?´s last blog ..The Gravity of Gravity or A Really Messy Kitchen =-.